1. Division - Count up how many water balloons you have in all. Then, figure out how many you and your friends will get. 2. Fractions - Choose what color balloons you would like and figure out the fraction for each color. 3. Addition - Water balloon bullseye! Hit the target, aiming for the sections worth the most points. Keep track of your score. Make sure you watch where your balloon bursts! Also, you probably want to tape the target marks. Otherwise, your board will wash away! 4. Geometry - Measure your balloon's circumference. What is the diameter and radius of one water balloon? Also, measure the length and width of your balloon. Can you figure out the volume? 5. Measuring - See who can throw their water balloon the farthest. Measure where the balloon lands. 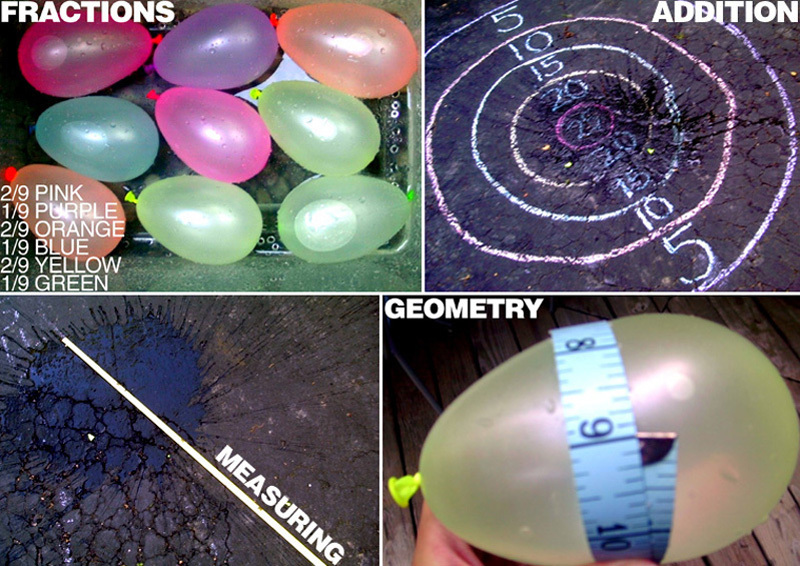 Click here for water balloon experiments, involving gravity and potential / kinetic energy.